This wreath can be made using a single wire form (available at most craft stores) or you can make your own form by bending a hanger into a circle and snipping off the hook. Unwind the top carefully using needlenose pliers and straighten as much as possible. Cut the lace in 1 yard lengths and layer. The sample here uses only two colors, but if you really want to get fancy, you can layer more colors, and use a narrower lace for the top layers. Thread your wire form in and out through the holes of the lace until completely covered. You don't need to thread through each hole, just enough to hold the lace in place. Once the lace is on the wire form, twist the ends of the wire together and hand stitch the ends of the lace together, or secure with a dab of glue. 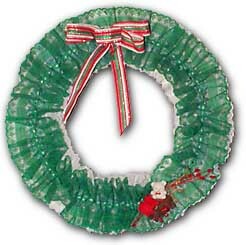 Use hot glue to attach florals, ribbon and other decorations to your wreath. Just about anything can be used to decorate your wreath. Use things that are colorful, sparkle, or just things that please your eye.